OK, I’m just going to get this off my chest. I’m a wuss. A wimp. And I’m not afraid to admit it (my strategy is to point out my shortcomings to others before they beat me to it!). My friend, Pia, posts so many gorgeous ethnic dishes that I would love to serve at my own table, but do I make any of the recipes she posts? Of course not–I’m either too lazy or too intimidated (probably both) to break out of my comfort zone enough to make my own Kimchi (which my hubby would much appreciate) or even something as American as General Tso’s Chicken (another of Dennis’ favorites) . 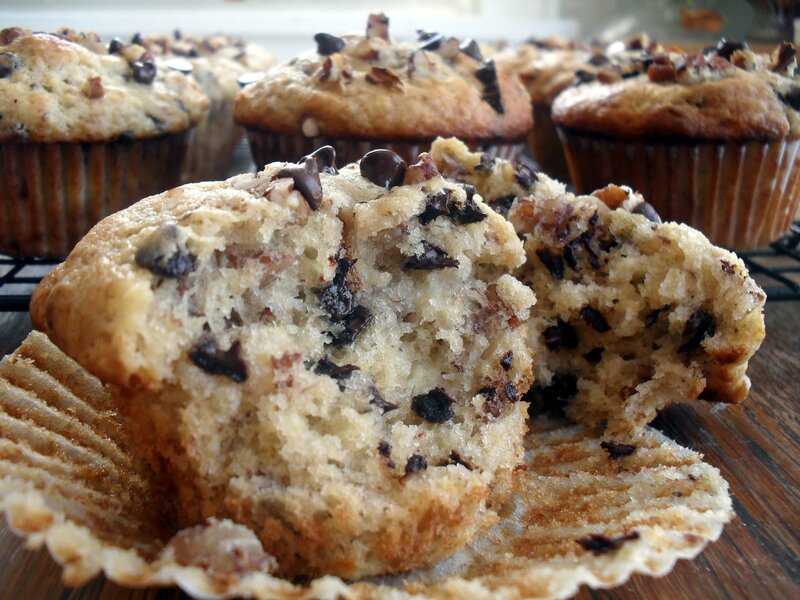 But yesterday she posted a recipe for Banana Nut Chocolate Chip Muffins and guess what I did? That’s right, I made them immediately. These babies were exactly the kind of thing I love whipping up, but they offer no challenge. If the muffins weren’t so delicious, I’d be disgusted with myself. Once again, I’m promising myself that I will, I WILL, make something from her blog that is not American and is not a dessert. And there is plenty to choose from. In the meantime, however, lets talk about these muffins. Preheat oven to 425 degrees F and line 12 muffin cups (you might need 14 as I did) with paper liners or grease them well. In a medium bowl, mix the flour, salt, baking powder and baking soda together. In another bowl, whisk the eggs and stir in the remaining ingredients one by one, including the nuts and chocolate chips (reserve a couple tablespoons of both if you want to sprinkle them over the top like I did). Using an ice cream scoop with a lever, fill muffin cups about 2/3 full and sprinkle nuts and chocolate chips over the center of each muffin (they will spread as the muffins rise). Bake for 8 minutes, then reduce the temperature to 350 and continue baking for another 6-10 minutes or until a toothpick inserted in the middle comes out clean. Let the muffins sit in the pans for a few minutes before removing them to wire racks to cool. 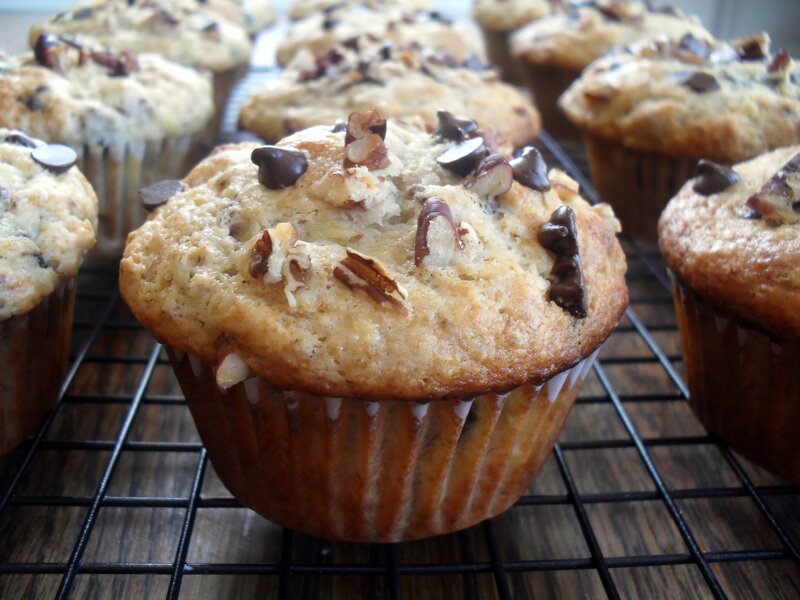 Tip: The burst of heat in the initial high temperature helps dome the muffins. Veronica’s Notes: I used bananas that I froze several months ago, just as I always do with anything calling for mashed banana. I constantly replenish my stock of frozen bananas because I like to have extra-ripe bananas at the ready–you never know when you’ll have a hankering for banana bread or cupcakes! I have a whole post devoted to the subject of over-ripe bananas and freezing them and you can find it here. Posted in Bread, Breakfast and tagged banana nut chocolate chip muffins. Bookmark the permalink. The look great! Now my dilemma is do share these with the girls at work or the cupcakes, or both? I can usually rope in 1 or 2 of them to make your recipes- I’m leaning towards the muffins, since we’re serving up pancakes at work on Friday, and these would be a great complement. Thanks again, again, Veron! Ok, those muffins look delicious! The photographs are lovely and the recipe looks to-die for. Thanks for sharing. And good luck getting brave! I can’t wait to check out some of this ethnic cuisine you are talking about. Thank you so much Melanie! I think I might start with the General Tso’s chicken and go on from there–at least that one is familiar to me–she posts so many things I’ve never heard of! Banana Nut aaaannd Chocolate? Score! I’m up late working on homework. I took a break and saw these and my sleep deprivation combined with their yummy-ness, almost caused me to lick the screen! And that over-ripe banana post is awesome. I will soon return to it and learn the magic of you muffin making! The muffins look awesome. I love Pia’s work. She has so much to share and for me to learn. I got your message about Cookie Mondays. You were very VERY smart to stop. I’ve been doing this for 2 plus years and can’t get out of it now until Jesse gets a new job. Thanks Laura, I agree on both points! I hope you’re better than me at self-control–that’s why I had to stop. Thank you so much V!! I’m blushing as i’m reading this blog. This is why i love “us” foodies coz we get to share and learn new stuff. Funny you mentioned about intimidation, as you’re intimidated with ethnic dishes, i’m intimidated w/ baking in general w/c obviously happened to be your specialty. But thanks to you, Kim, Marina and the rest of our foodie friends, i’ve challenged myself to bake at least once a month just so i’d over come and get to enjoy what you guys are enjoying! ha!ha! So, i guess it’s time to try some of the ethnic dishes! (wink, wink) I suggest start w/ the Gen. Tso’s, ingredients are easily available, flavor is not overpowering and so good ask Kim. Perhaps Kimchi will be next for Dennis sake lol! I have put Gen Tso’s chicken on next week’s menu–wish me luck! And thanks for inspiring me–LOVE YOU GIRL! oh Lord, these look amazing! I tried this recipe twice now, and both times it came out perfect. This time I gave some to my Mom and she really enjoyed them…. She’s now happy that her son can puck up the torch and finally start paying off my pastry debt, LoL. LOL! So glad you like it!